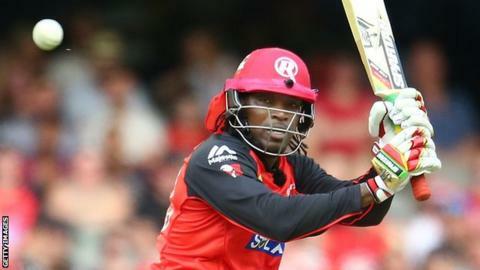 Chris Gayle hit a record 18 sixes as he smashed an unbeaten 146 off 69 balls for Rangpur Riders in the Bangladesh Premier League final. The West Indies batsman, 38, beat his previous record of 17 sixes, set in the Indian Premier League in 2013. He also struck five fours as he amassed the highest score in a T20 final and became the first player to pass 11,000 runs in Twenty20s. Gayle helped Rangpur make 206-1 in 20 overs against Dhaka Dynamites in Dhaka. He added an unbroken 201 with former New Zealand captain Brendon McCullum, who made 51 not out off 43 balls. Gayle is the leading scorer in this year's BPL with 485 runs from 11 games at an average of almost 54 and strike-rate of 176. His 146 not out is the 10th highest score in T20s. His unbeaten 175 for Royal Challengers Bangalore in the IPL remains the highest.